To mark the forthcoming release, images of the sleeve art were displayed in prime spots in numerous leading cities including London's Southbank, as well as New York, Los Angeles, Paris, Berlin and Milan. Thorgerson's former colleague at the design company Hipgnosis, Aubrey "Po" Powell led the task of finding an image which would carry on his legacy. Powell said: "When we saw Ahmed's image it had an instant Floydian resonance. It's enigmatic and open to interpretation, and is the cover that works so well for The Endless River." 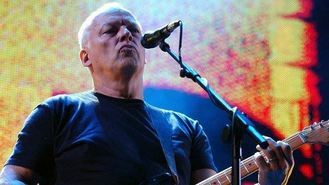 Guitarist Gilmour said: " We listened to over 20 hours of the three of us playing together and selected the music we wanted to work on for the new album. "Over the last year we've added new parts, re-recorded others and generally harnessed studio technology to make a 21st century Pink Floyd album. "With Rick gone, and with him the chance of ever doing it again, it feels right that these revisited and reworked tracks should be made available as part of our repertoire." The 18 tracks are divided into four sides and it is mainly instrumental, apart from one track Louder Than Words with a lyric written by Gilmour's wife, Polly Samson. The group released a 30-second teaser clip of first track It's What We Do on a new website pinkfloyd.com/theendlessriver today. Drummer Mason said: " The Endless River is a tribute to Rick. I think this record is a good way of recognising a lot of what he does and how his playing was at the heart of the Pink Floyd sound. Listening back to the sessions, it really brought home to me what a special player he was." The album is to be released on November 10 in a range of formats.